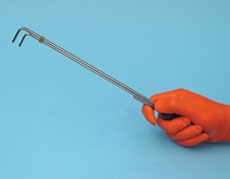 These low-cost tongs are used to handle small radioactive or otherwise dangerous objects up to 1" diameter. The tongs have a 45° v cut groove on each jaw. The compression spring maintains a strong grip on the object until the tension is released by squeezing the finger bar. Niptongs are made of chrome-plated, high carbon steel with hardwood handles and are easily disassembled for decontamination and cleaning.